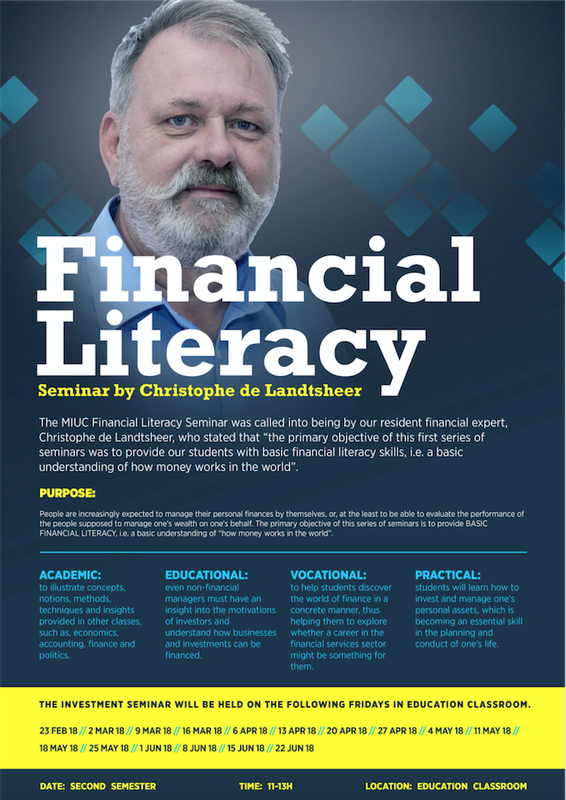 The MIUC Financial Literacy Seminar was called into being by our resident financial expert, Christophe de Landtsheer, who stated that “the primary objective of this first series of seminars was to provide our students with basic financial literacy skills, i.e. a basic understanding of how money works in the world”. Before investing, and exposing capital to risk, it is imperative that one have a firm grasp on the essential concepts of understanding of financial markets, financial institutions and instruments, profitability and risk assessment techniques. Whilst theoretical knowledge is key, acquiring some initial hands-on trading and psychological skills may be considered of equal value. Although our students will not be accomplished investors at the end of this cycle, they will have received a solid foundation on which to further expand their investment skills. The core objectives of this seminar are multifaceted: in addition to acquiring financial investment skills, the seminar strives to illustrate the concepts, notions, methods, techniques and insights provided in other classes of similar ilk, such as economics, accounting, finance, and politics. At MIUC, we believe that even non-financial managers should have an insight into investor motivations investors and understand how businesses and investments can be financed. On a practical level, we aim to help our students discover the world of finance in a concrete manner, helping them to explore the idea of whether a career in the financial services sector might be of interest to them, by first learning how to invest and manage one’s personal assets – an essential skill for planning and conducting one’s life –whichever field of study one may choose to pursue. Everyone today is confronted with the question of how to handle his or her savings. Even people who are not interested in managing their personal finances themselves have to understand some basics about wealth management. With this seminar MIUC wishes to ensure that ALL its students have a CONCRETE and PRACTICAL insight in the way “money works in the world”. As you will all discover at some point, it is at least as hard to make money as it is to preserve and protect one’s savings. The seminar intends to provide a practical underpinning to what business students learn in the courses. Non-business students will also very much benefit from attending. They will learn the basics of personal finance management and will acquire the necessary skills to talk to financial intermediaries (bankers, brokers, etc …). During the first session we will explore what financial themes preoccupy the student participants and we shall as much as possible respond to these by inviting external speakers who can professionally address these concerns. Finally, the seminar will also be fun as it comes with an exciting virtual investment competition. People are increasingly expected to manage their personal finances by themselves, or, at the least to be able to evaluate the performance of the people supposed to manage one’s wealth on one’s behalf. The primary objective of this series of seminars is to provide BASIC FINANCIAL LITERACY, i.e. a basic understanding of “how money works in the world”. Before investing, and “exposing capital to risk”, one needs to have at the least some basic understanding of financial markets, taxation, financial institutions and instruments, profitability and risk assessment techniques. Furthermore it is all-important to acquire some initial trading and psychological skills. You will not be an accomplished investor at the end of this cycle, but you will have received a solid foundation on which to further expand your investment skills. To illustrate concepts, notions, methods, techniques and insights provided in other classes, such as, economics, accounting, finance and politics. Even non-financial managers must have an insight into the motivations of investors and understand how businesses and investments can be financed. 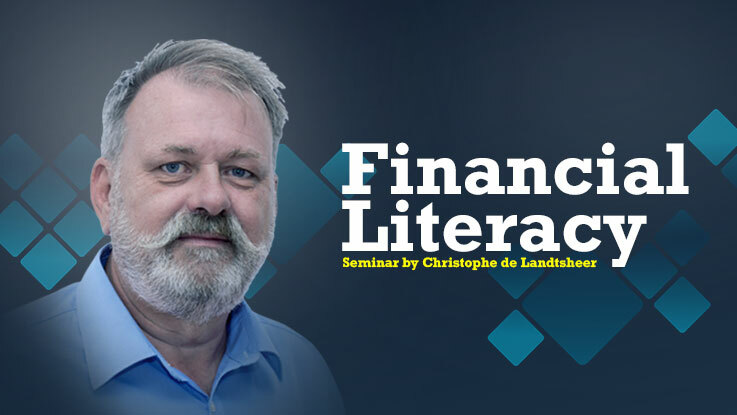 To help students discover the world of finance in a concrete manner, thus helping them to explore whether a career in the financial services sector might be something for them. Students will learn how to invest and manage one’s personal assets, which is becoming an essential skill in the planning and conduct of one’s life. The investment seminar will be held on the following Fridays from 11 to 13 hours in the EDUCATION room.